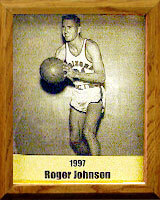 Roger was a 1948 graduate of Tucson High School where he played basketball and was captain of the All-State team. He also played baseball and was team captain in his senior year. Roger continued to excel at the University of Arizona in basketball and baseball. He was the first UA basketball player to score more than 1,000 points in three years; was All-Border Conference three years; and was captain in 1951. Roger also was named All-American in 1951. He was a recipient of the Fred Enke Award in 1952. The Bobcats named him Outstanding Senior Athlete in 1951. In baseball, he was named All-America in 1951. After graduation he played for the Boston Red Sox organization. Roger joined the U.S. Air Force and rose to the rank of Colonel. He played on the All-Air Force basketball team in 1957 and was player-coach of the Air Force team at Chaumont, France, in 1958.